September 16, 2008 deputy governor of the Bank of England, Charles Bean, described this recent economic downturn in apocalyptic terms saying: “This is a once in a lifetime crisis, and possibly the largest financial crisis of its kind in human history. 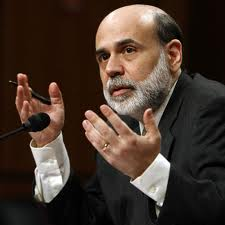 Then a year later, Federal Reserve Chairman Ben Bernanke said: “The worst recession since the 1930s is probably over.” Then on Friday, Chairman Bernanke said: “With respect to longer-run prospects, my own view is more optimistic. The growth fundamentals of the United States do not appear to have been permanently altered by the shocks of the past four years.” Hmmm? He illustrates human beings capacity to lap up good news and their equal capacity to filter out bad news. When the market goes up on any given day; I read the business section and check on retirement funds. If the market hits the skids, I’ll just wait it out for awhile until I can get some good news again. This is about denial and we all have a great capacity for it. As a market analyst, Jeremiah is a contrarian. When the fortunes of Judah seemed glowing, he predicted gloom. Jeremiah said the economy will fail and Judah will be overrun by a foreign power. The year was 588 B.C. Jeremiah had been pronouncing woe on the southern kingdom for over a decade. He knew sooner or later, faith in political power, rather than spiritual power would come home to roost. This went over like a lead balloon, no one really believes a contrarian analyst anyway. The unfortunate result of denial is things can turn so bad, while in denial, it becomes too late to do anything. By the time of Jeremiah 32, it was too late. King Zedekiah placed Jeremiah under house arrest to shut him up, which never works; truth will always tell itself. Judah was experiencing what Jeremiah predicted. Homeland security failed, the insurgents were camped on the doorstep and the siege of the city would soon be complete. Nothing would be left behind, no houses, fields, or vineyards, except those who were of not threat to these foreign invaders. In the midst of hopelessness, God intrudes to assure the nation that God isn’t giving up. God tells Jeremiah to make a foolish investment in the future of his people by purchasing a piece of land. Jeremiah’s cousin, Hanamel, wants to unload family property in nearby Anathoth. The army of the great unwashed, Nebuchadnezzar’s garrison is camped there; destroying the grasslands and crops. This insures the land will not be worth a dime on the dollar. Cousin Hanamel goes to Jeremiah; knowing Hebrew law would allow next of kin to maintain the privilege of possession or right of redemption. The law says no one owns the property except God, but the privilege of use can be passed to a family member; in order to keep it in the family. Jeremiah buys it. Jeremiah has never been accused of being in his right mind. As he is regaining his reputation as earlier forecasts were now being confirmed; he does something economically dumbfounding. He buys the land, pays top dollar, and declares it a good deal. Standing there in chains he asks the scales be brought to the courtyard; the guards and bystanders must have been having a good laugh. He weighs the seventeen shekels, signs two papyrus copies of the deed, his secretary seals them in an earthenware jar, to be preserved for generations to come. This scene becomes a witness to God promises for the future. Though the world didn’t value their houses and vineyards; God values them. They’re disciplined; but not being written off. Jeremiah demonstrates trust in God’s promises by publicly making this investment. During the next seventy years, when it seemed hope was lost; they would recall the warbler of woe words: “Houses and fields and vineyards shall again be bought in this land. God will not let Israel go through judgment without hope; they will return home one day. In the same way, Jeremiah had privilege of possession on the land; God has the privilege of possession over the people. God has the right of redemption and fully intends to exercise it. This story of Jeremiah buying the family farm as a symbol of hope disturbs me. Would I have enough faith to publicly invest in something all else gave up on? You know something about this kind of faith investment. Building and paying for this sanctuary over this last decade is such an investment. You have built a wonderful mission base, which stands tall over our city. Then when much begin to change, you remained committed to this mission base. A mission bases are built to launch us into our mission field. At this moment in our history, you, the people; and I, the pastor, have been joined together to serve God and our neighbors. I prayed like never before ahead of stepping into this ministry. 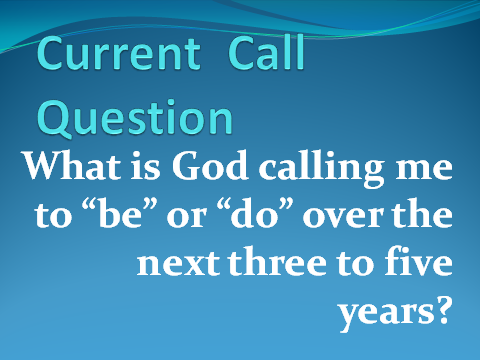 God pressed on my heart to invite each person to ask and answer –What God is calling each of us to do in the next three to five years. I felt compelled because I knew it would turn us to our mission field. God’s call always turns us to our neighbors. My understanding of FUMC’s journey is we have invested into the necessity of building this mission base. At the same time, you have also invested yourselves as much as possible serving this community. Is it time to be more focused on our mission field over the next decade? You sacrificed your tightly budgeted time and hard-earned money to invest into building this wonderful sanctuary. Now is it time to invest in building up the people who have not yet come? You invested in a place which you may only benefit for a short time. Now is it time to invest in people you may never know as well as you know each other. You have faced obstacles and believed what lay ahead was not impossible, but achievable. Now is time to overcome the challenges of making new places for new people. We can invest in our future; believing others equally deserves the right to experience this community of faith, which has blessed so many other generations. This place is worth investing ourselves. Choose to invest in a future, which believes you can hear the voices of noisy children and crying babies replacing the hollow echoes heard now in Son Rise Village and in our nursery. Choose to invest into a future of small discipleship opportunities, which can fill these empty classrooms. Choose to invest into a future that may not be familiar, but might save the soul of a person you do not know. God can fill this sanctuary, classrooms, and halls with sounds of a growing body if we are willing to make an investment into the future for the sake of others by answering the call of God in our lives. I’ve been a benefactor of someone investing in my future. I can recall a moment of hopelessness, and someone believed in me and invested in me. When everyone else walked out, this person walked in. That kind of investment into an unknown future almost always come from someone who has heard and is responding to the call of God in their life. When God hatched the plan to invest it all in a sinful humanity by sending the only begotten Son, I think the angels must have whispered under their wings, “Has God gone bananas? God may have lost God’s mind, but God hasn’t lost God’s heart. Jesus going to the cross is the same kind of investment into the future as Jeremiah’s real estate deal. Both say, just as a down market can turn upward in a moment’s notice on the good word of a good man, so can our life and this church turn upward on the good word of a good God. It may take awhile to notice the change in our value, but when it does, it will be because God has paid the highest price possible for our future. May we act as our God did and invest into our future in the name of a God who has been investing into the future of every generation. Let this video help you think about your own commitment to what God is calling you to do or be in the next 3-5 years. What is Really Important When Life’s Clock is Ticking? One more thought today, picked up off Facebook from Eric Folkerth; posted here to share and keep for future reference. Said from a man who reshaped the global landscape. 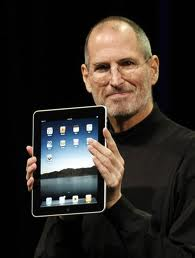 –Steve Jobs, Chairman, and former Chief Executive Officer of Apple Inc.
Have you done something that seems contrary to human wisdom because you believed it was divinely inspired? Have you ever acted, knowing you were only planting a seed God would bring to harvest beyond our lifetime? 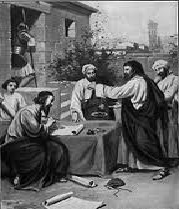 Jeremiah’s doubtful deed of signing a doubtful deed for a worthless piece of property is just such an example. Persons of faith not only read the signs of the present times; they must also act on their confidence of future times. When everyone around is pulling their hair out, a person of faith keep their head; acting upon a vision of the future that only faith can bring into view. 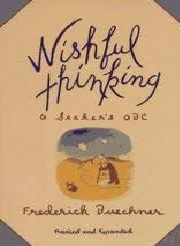 Learning how to think backward from the future, not forward from the present is a skill needed. Therefore, we do not engage in improvement programs for the world. We contradict the world as it is, by acts of faith in the world that will be. Earnest Campbell once preached a sermon at Riverside Church in New York, he said: To be young is to study in schools that you did not build. To be mature is to build schools in which you will not study. To be young is to swim in pools that you did not dig. To be mature is to dig pools in which you will not swim. To be young is to sit under trees that you did not plant. To be mature is to plant trees under which you will not sit. To be young is to dance to music you did not write. To be mature is to write music to which you will not dance. To be young is to benefit from a church that you did not make. To be mature is to make a church from which you might not benefit. Execute doubtable deeds that God can turn into hopeful seeds for generations to come. There’s no time to lose. You better get started this today. I despise reality shows; we have enough reality each day. I want my TV to give me news, sports and unreality, thank you! Colonial House, a PBS show; following pastor Jeff Wyers of Community Baptist Church in Waco, along with his family, and 20 volunteers who for four months lived as a Puritan colony. They milked goats, raised corn, and produced goods to repay British backers. Women submitted to men, and everyone submitted to the pastor, who was also the governor. There was mandatory attendance at three-hour church services. Ah, the good old days! God and Israel took vows at Mt. Sinai after God delivered the Hebrew slaves. The Exodus and parting of the Sea gave God’s people a current event, which to build their faith as they experienced future. They knew there’s only one God and others are pretenders, created by the powerful to keep them in power. They knew God is on the side of the powerless instead of a pharaoh. They knew only their God can make and keep promises. They knew they were partners with God to make things happen. Israel was to show loyalty to her God by paying attention to the Ten Commandments. These laws regulated their faith life together and teach them how God loves them and how they were to love God and each other. The religious laws had a spiritual purpose; it kept their hearts from going astray, their souls from warping and their relationship with the God. They fail to keep the old covenant, not paying attention to the law God had given. The covenant was shattered by their unfaithfulness and they were exiled. “I will make a new covenant with Israel and Judah. 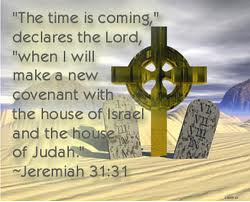 For, I was their husband, and they broke the first covenant.” The God of their old covenant comes speaking through the voice of Jeremiah saying: “I’ll do something new with this old covenant”. We can imagine how offering to do something new with that which was old must have lifted the weight of doom and buoyed their hopes. This meant God had not divorced them in order to marry another. God comes as a wounded lover and fights through their neglect to woo them back. God was doing something new with the old covenant so to court the people back into their creator’s loving arms. We contrast the Old Testament with the New, the Hebrew God of the Jews with the God of the Christians, and the letter with the spirit. This causes us to leap over Jeremiah to Jesus thinking we need to jump over religion so we can have real true experience with God. This makes little sense in light of this text, which points to the unbroken nature of the work God throughout all of salvation history. God’s former people in exile are promised a new and genuine experience of God doing something new with the old. The nature of the continual redemptive work of God is continuous. God doing something new; is what God does in every generation; relentlessly and lovingly redeeming God creation so we may renew our relationship with God. God continually updates God’s redemptive work that began in the Garden, and which God will be consummated in God’s time. The Torah sill matters. We have not grown up and out of the Ten Commandments because we have Jesus in our heart. They would still need to pay attention to old covenant. These rules give a peek at God’s heart. 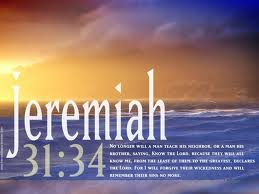 What Jeremiah promises; God is relocating the law. The remedy applied in this redemptive promise is summed up when God says: “I will put my law within them, and I will write it on their hearts.” Writing the law on your heart means the law would be seared on their conscience; become second nature as it is first nature to God. During the Vietnam War, American bombers would fly over rivers bombing every bridge in sight. Yet thousands of Vietnamese troops would cross the rivers anyway. Years later an American pilot met a Vietnamese general who was now a businessman. He asks, “How’d you get them across the river”? The guy replied, “We built the bridges six inches under the water.” God’s new covenant takes what has been an external code of morality and begins to build it inside of us—six inches under the skin. In both covenants, God wants love to rule. Persons of faith bounce between a love of law and the law of love. This struggle between law and love; we see in the people of Israel so long ago. We see it in the synagogues and temples of Jesus day. We see among the Puritans at Massachusetts Bay Colony. We see it in every church of every flavor. In every case, we become so concerned with conformity and control; we prevent people from knowing the continual redemptive work God, Jeremiah promised. It is a failure to capture the essence of the new covenant of gracefully writing the law of God on the heart of God’s people. Strict conformity to rules does not save; it competes with the grace of Christ that produces hearts of love. God doesn’t want people who have to be instructed by written codes which are enforced by others who claim to know God better. This causes people to point fingers, look at neighbors for what they are doing wrong, and creates climates of mistrust. A community of faith that lives in fear of wrongdoing rather than by faith in right-doing is sick community. Relationships based on “oughts” and “shoulds” never rise to the freedom and joy God desires. Hear the irony; hearts filled with graceful love embrace the rules as guides on how to love. They welcome rulers who oversee the community by infusing the living presence of the Spirit of Christ in all they do. I have guest today who I want you to meet who lives in one such setting. Let me introduce the setting with this video. Brandon L azarus is a seminary student who lives in the Bonheoffer House. It is a neo-monastic house that lives by rules of order and offers themselves freely to their neighbors. I am going to let him tell you little more what this is about. What is your understanding of intentional living? ; Why do you do it? ; What are its benefits? The best communities of faith look like to lovers who just fall further and further in love. When you are first attracted to someone; you have questions and listen carefully to see what she loves, what he likes, what bothers her, and what moves him. As you come to know that person, there is a desire to please and anticipate what would please the one you love. After a while, you learn what to say and not to say, how to act and not act. You move before you’re asked; finishing each other’s sentence, you know them by heart. 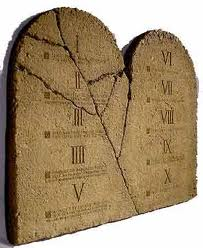 God wants to move the ten words from stone tablets to human hearts and so our faith is formed and character reformed. God will not rest until we know God so well we don’t need to be taught anymore because we have caught the heart of God. Now that is the heart of the matter. 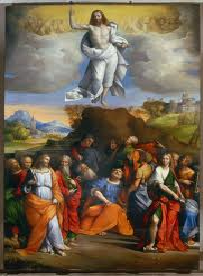 Jesus told his disciples before returning to heaven they will receive the power of the Holy Spirit and they were to be his witnesses in the world. Jesus is telling them to look out before you look in. Jesus did not say create great worship, so everyone is happy. Jesus did not say create relational small groups, so everyone feels connected. Jesus did not say create financial campaigns, so everyone learns the joy of giving. Jesus said the Holy Spirit will give us eyes to look outside; to see the human condition in need of the grace of God. This outward look of offering Christ to the world happens before they take an inward look of taking care of the body. Many stories in Acts start with someone seeing a need. Once seeing the need these early followers of “The Way” would offer the grace of God to the people in need. This they did so in a multitude of ways-Peter preached and healed, Barnabas sold his land, Stephen offered his life, and Paul set sail for a savior. Witness and mission preceded worship, nurture, and stewardship. It starts with a witness that is connected to a mission, which fuels worship, created networks of nurture, stimulates creative stewardship marked by unprecedented generosity. It begins from the outside and then turns inward. The story of Paul and Barnabas seeing a crippled man in Lystra provides an overview for this series. We see their witness when it says, “In Lystra there was a man sitting who could not use his feet and had never walked, for he had been crippled from birth. He listened to Paul as he was speaking. And Paul, looking at him intently and seeing that he had faith to be healed. First, they looked intently and saw the need. Looking at the world the way God sees will be our catalyst for reconsidering our holy habits. I want to use showing up and seeing what is happening outside the walls of our church as the springboard in reconsidering the holy habits of witness, worship, nurture, and stewardship. These holy habits require us to look to our neighbors and to our savior. Then, we will turn inward and consider inward holy habits. Supporting the mission base will be reconsidered in light of how we interact with the mission field. I hope to reverse the starting point when thinking about our Holy Habits from the Outside In. Congregations can activate the power of the Holy Spirit by making their first priority to intentionally look out beyond themselves. When this happens everything else takes care of itself. What makes our religious habits holy is by stepping into the line of vision of people outside the walls of our church. This creates opportunity to be changed in the way we and they see the world. The more ways we offer our witness, the more God’s spirit can shape our holy habits. The holy habit of worship expands in proportion to our expanded view of what God is doing. The holy habit of nurture grows in fellowship and word as we celebrate these new sightings. The holy habit of stewardship moves beyond our “offering plate” mentality as we see what possessions we hold in common and how we are to share them. We fool ourselves into thinking our holy habits of: witness as usual, worship exclusively with the faithful, nurturing our own church family; and raising funds to perpetuate the institution is enough. These will not breed holy habits, much less generosity. We must reconsider our holy habits by entering into a conversation with our neighbors; giving a witness to the good news. There are people just around the corner of our church who need us to show up; more than they need our usual habitual ways. We need to reconsider our holy habits. Law matters. Some times we New Testament people behave lie we have grown up out of the Ten Commandments because we have Jesus and we really know God. So, when Jeremiah said I am writing the law on your heart in chapter 31, he was insisting the law would sear on our consciences; become second nature in the way it is first nature to God. The rules that regulate our faith life together give us a peek at God’s heart. They teach us how God loves us and how we are to love one another. The bottom line, in both covenants God wanted love to rule, but sometimes as the apostle Paul said law is our tutor until our hearts to beat as one with God’s heart. When you first meet someone you are attracted to or want to know, you have lots of questions and listen carefully to see what she loves, what he likes, what bothers her, what moves him, that sort of thing. As you come to know that person deeply, there is a desire to please and anticipate what would please the one you love. After a while, you learn what to say and not to say, how to act and not act. Before long, you get to where you move before you are asked. You finish each others sentences. Words are unnecessary because you come to know your lover or friend by heart. This is the kind of relationship God wants. God doesn’t want people to have to be instructed by written codes that are enforced by others who claim to know God better. That kind of Christianity ends up like the Puritan piety with people looking at their neighbors for what they are doing wrong, pointing fingers, and creating a climate of mistrust. A community that lives in fear of wrongdoing rather than by faith in right-doing is a sick community. Relationships based on “oughts” and “shoulds” never rise to the freedom and joy God desires. The something new promised by Jeremiah in this new covenant is God will not rest until we know God so well we don’t need to be taught anymore because we have caught the heart of God. God moves the ten words from stone tablets to human hearts and becomes even more involved under our skin until our faith is formed and character reformed. When you get down to the heart of the matter, knowing God deeply and intimately is about forgiveness—God’s forgiving nature and our acceptance and practice of it. It isn’t just a matter of getting all the “dos” and “don’ts” tattooed on our hearts; it’s about having the heart of God transplanted into our own. This means we are convinced we are forgiven as the Lord promises. This means we begin to practice forgiveness toward others and ourselves. We may think what ruins relationships is the way we hurt each other with our wrongdoings of some kind. It isn’t sin that comes between us as much as the lack of forgiveness. When we forgive one another, we build a bridge back to the heart of our beloved. When we are forgiven, we can be at ease in the presence of our beloved again. This is what God has done to enable us to know God intimately in the old and new covenants. God desires to write that reality of forgiveness on and in our heart. “God has forgiven our iniquity”, Jeremiah tells us, “and remembers our sin no more.” Now that is the heart of the matter. Hitler took Niemoeller into custody. He refused leave ministry when told he could go free if he would do so. Hitler would not pardon the stubborn pastor. Defiantly, the Fuehrer declared, “It is Niemoeller or I”. Sadly, the church did stand with Niemoeller. The church failed to act and 6 million Jews, gypsies, handicapped persons, and enemies were murdered. 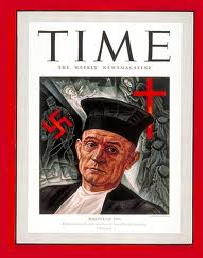 Some in the German church did not bow to Hitler, but many were silently complicit. The church didn’t take care of the German people. Jeremiah’s words avow the welfare of the city is the responsibility of the church. God’s people were exiled by Nebuchadnezzar; moved to a foreign land whose customs assaulted their sense of decency. They wanted to return to home; rebuild what they had lost. Jeremiah, through his tears, told them they would not returning to Israel, instead they would settle, build houses, marry, have children, and establish a home among their captors. The people of Israel wanted to escape Babylon, not build it. We hear their frustration about exile in their asking the wrong question: “How long must we live in this foreign land? The right question would be: “How shall we live in this land?” Jeremiah instructs them: Seek the welfare of the city where I have sent you…for in its welfare you will find your welfare. They are to give themselves to those where you live; work on their behalf. 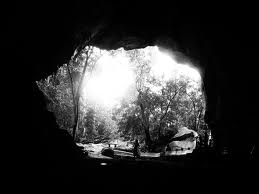 We experience exile as a metaphor; feeling out of sorts in this world-exiled. So, songs like “I’ll Fly Away” and “Sweet By and By” speak of our exile longing for our home in heaven. The longing is healthy. The problem is not in the longing. The issue is how we live because of the longing, even when false prophets tell us what they want to hear. Time would bear witness that God’s people would live in exile for seventy years; wrestling with why the chosen were not “saved”. They would have to live by their convictions in a place that didn’t share their values. Their faith became less organized around a place, the temple of God; and more focused on a relationship with the Living God. The forced relocation was formative; became one of the most creative periods in their history-the synagogue was born and the Hebrew canon was written. The fruit of this time in exile would sustain future generations for centuries. In Babylon, they incarnated, like never before, their original God intended mission-be a light to the nations. The correlation between exile and mission come clear in Babylon, as captives live as the people of God in a strange land. The way to live into our exile is to fulfill our mission of being the people of God while in exile. We offer a unique witness by seeking the welfare of the people with whom we live in our own strange land. Our exile is defined loosely; making it difficult to discern a specific missional witness. So, faith communities have responded in various ways, some better than others. It is clear there’s no justification for separating out. We are to pour ourselves out into our world with a unique witness that seeks the welfare of all. 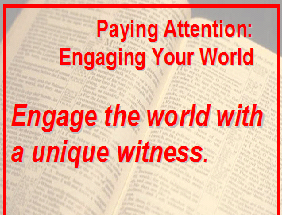 Engage the world with a unique witness. This means offering an alternative witness that counters all the ways that deafen the good news. We’re too cozy with business as usual. We know more of judgment, than grace; more about my own concerns, than elevating other’s concerns above our own; more about the needs of individual, than the needs of the community. We shouldn’t readily accept this is the way it is. It isn’t enough to call for personal confession in Jesus and not offer a shared model that challenges deep-seated ideas that are at odds with Christ’s way. The world around us is starving for our unique witness we offer. In the face of greed, we offer practices of generosity and simplicity. To our culture’s thirst for violence, we offer: peacemaking, radical love, and the golden rule. To a society that suffers from chronic loneliness, we offer a community of faith who consider each other sister and brother. To the rise of hostility toward strangers, we offer hospitality that welcomes strangers as friends. To a people over-worked and undernourished, we offer Sabbath; reminding ourselves we are not self-sufficient and remembering God is our provider. These practices are the unique witness of God’s people. 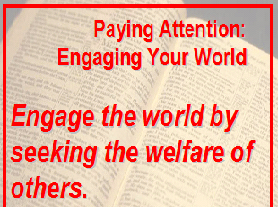 Engage the world by seeking their welfare. Welfare is a word that has lost its positive meaning. The word was good enough for our founders to include in the preamble to the Constitution-along with insuring domestic tranquility, providing for common defense, the government is to promote the general welfare. We debate the extent of government’s role. We should spend less time complaining about irresponsible government and more time examining our responsibility in seeking the welfare of the city, state, and country for the benefits we receive as citizens and as the church. The social contract the church has with the state is we don’t pay property or sales tax because we’re seeking the welfare of the city. If the institutions the church spawned were removed from our communities one could hear kindness go down the drain; sapping life out of our neighbors. The word Jeremiah chose means more than basic survival. Biblically welfare means to seek God’s “shalom for all people helps to us. Shalom is a keynote word in the old covenant. It is the word Jesus greeted his disciples with after the resurrection. It means to be made whole with God, so we might be well within and able to prosper in all of life’s relationship. Jeremiah word from God to seek the welfare is a distinct spiritual mandate that God’s people are to address the needs of the entire community. A prime example is the Family Promise organization whose informational breakfast I and Rod Alleman attended this week. This is ministry that transitions homeless families back to stability in less than three months. The city budget does not subsidize that project through taxation; churches, fundraisers and individuals make this happen. Watch a video introducing you more to this wonderful organization that engages the city by clicking anywhere on this sentence. I’m not saying if the church would do its job, we wouldn’t need government. We are fortunate we live in a land where we can actually seek the welfare of the city by simply fulfilling our duty as citizens of our great country, state and in the towns where we live. Israel didn’t have such freedom, yet God told them to do so. We can participate in decisions about our communities; as spiritual pilgrims who are seeking the welfare of all people. The God’s people highest allegiance is to God. 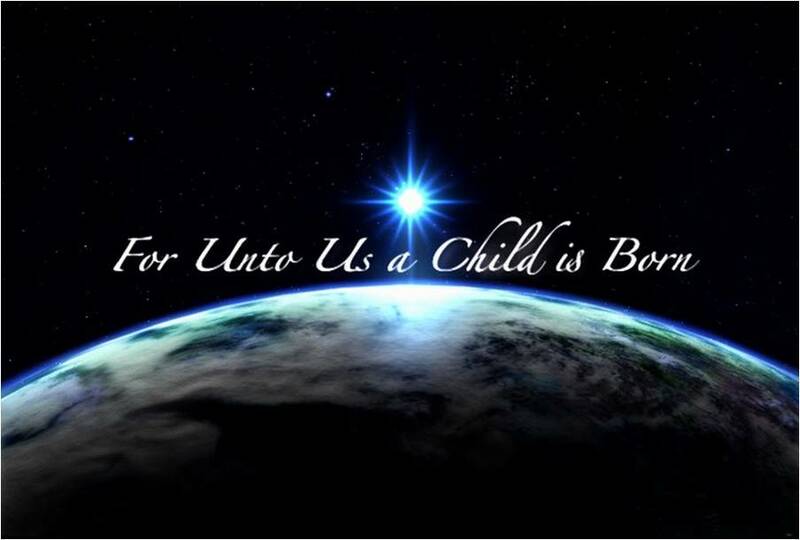 God does not divide the God’s world into categories such as our children and their children, north and south, white and black or brown, Republican and Democrat, deserving and undeserving, Christian and non-Christian. Our lives are tied together; so we cannot come to church only to worship a God in order to comfort our souls. That is a god of our own making. We must be convinced when we leave here we will seek the welfare of the whole city because our welfare in here is tied to others welfare. Our neighbors are waiting! Jeremiah’s words avow the welfare of the city is the responsibility of the church. God’s people were exiled by Nebuchadnezzar; moved to a foreign land whose customs assaulted their sense of decency. Jeremiah wrote to them: Seek the welfare of the city where I have sent you…for in its welfare you will find your welfare. They wanted to return to home; rebuild what they had lost. Jeremiah, through his tears, foretold their fate. I am not calling you to return to Israel, they were to settle, marry and have children; establish a home among your captors. The people of Israel wanted to escape Babylon, not build it. We hear the frustration: “How long must we live in this foreign land? That is the wrong question. The right one: “How shall we live in this land?” The answer is: give yourselves to those where you live; work on their behalf. This is what God requires. Looking for God in all the Wrong or Right Places? Check out this article summing up which is George Barna State of the Church for 2011. (Good luck plowing through it, good material but long) Then there is this summary article of the report that might be easier to digest. Read it here by clicking anywhere on this sentence. These reports points to how there is a growing disconnect between congregational life and religious experience. I try to read interpretations of data, such as in this article, with open eyes. So, I offer my interpretation of this study with a degree of humility. For more than a thousand years it has been assumed disciple’s growth was “picked up” from the society; the world of Christendom was the “teacher” of the faith. There is a surprising gap between the experiences ordinary people have of God and the experience they have of their congregations. A growing number of people are speaking of spirituality in terms of having a direct experience with God. People don’t connect those experiences with the religious congregations. 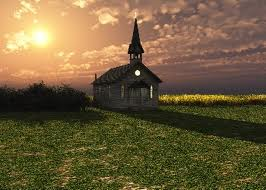 They feel the congregation expects their support and attendance at worship and activities, but that the congregation has no interest in their religious experience. Congregations are to be a place where religious experience is welcomed and nurtured. The world needs places with a sense of community, which each person’s experience of God is affirmed-or at least brought into the open. Fellowship is not a social, but it is being a part of group that provides space for intimate storytelling and encourages members to share those deep experiences. Congregations are needed that take any experience of God as the norm. Thus I think a congregation that can find ways to recover mystery, so it can be shared and not judged will thrive in the coming days. What say you? We are a nation of self determined people; founded on the hope no one person would be our sovereign king or queen. The desire to be free of a singular political influence is deeply imbedded in the American psyche. You can thank me and my baby boomer generation for distorting this core American value with our zealous individuality; that fooled us into thinking we can do whatever irresponsible thing we want. We passed this disease onto our children who are filling our land with lots of lonely monarchs who think they do not answer to anyone. I pray God will raise up persons who recapture what it means to live responsibly with others in our free land. Christians who freely take on their responsibilities as citizens of a free land should be the loudest voice for taking responsibility in God’s kingdom. We profess a distinct appreciation of the privileges of living freely. 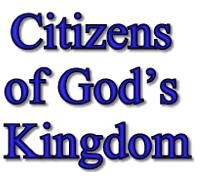 Thus, we are in a better position to value what it means to profess the Living God breathe into us the breath of life and stamped God’s image on us; hoping we might freely chose to become responsible citizens of God’s kingdom. Appreciating the value of being responsible members of a community, should prevent us from easily embracing this terrible theological idea that can jump up from this text that God can do anything because we’re putty in God’s hand. 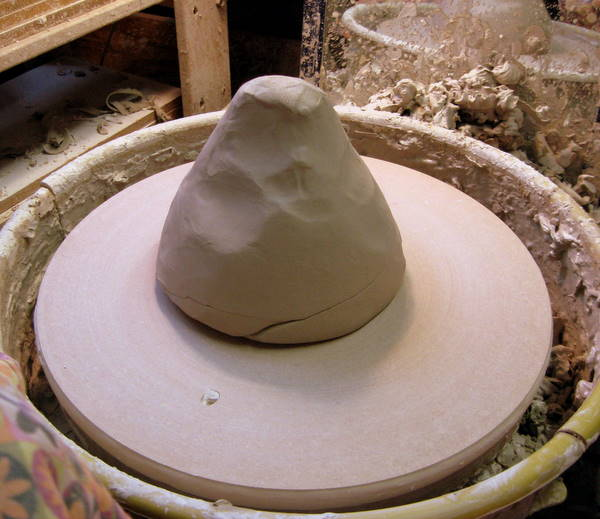 It’s negligent to say we’re nothing but clay, and have no more say in cooperating with God’s shaping work in our lives, than a lump of clay has say to the potter. It’s nonsensical to imply no accountability in our relationship with God since God is omnipotent and we are impotent. The problem with this understanding of God is we have little opportunity to participate meaningfully in a relationship with our Creator. We are not heav enly-controlled model airplanes. We are persons free to soar with the Spirit as we cooperate with the hand of God shapes us. A fundamental core value in the Kingdom of God is to cooperate and partner with God’s shaping hand in our lives and work. We do so, when there is wrong, evil, or injustice God empowers us to offer remedy. We do so when there is grace, beauty and God’s glory God invites us to name it and bless it. We are not victims to divine circumstances; we God’s fellow laborers. God invites Jeremiah into the Potter’s house to get his attention regarding how God shapes our work. Jeremiah is reminded that though God may do whatever God wills, the primary thing God wills is for us to freely to respond to God’s intentions for us. Thus, God willing endures the possibility of regret and suffering if we do not freely choose to enter into a partnership with God. Our God is a patient and creative artist wanting us to reflect God’s character. This passage invites us to pay attention to how we cooperate with God’s shaping hand on our work. 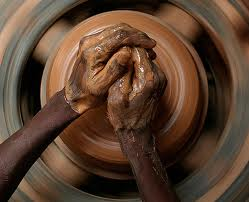 Judah was no longer willing to be formed by the potter. Her foreign allegiances and idol worship put her at odds with her Maker and outside the will of God. Yet, these disobedient behaviors were nothing more than symptoms of their unresponsiveness to the shaping hands of God in their lives. Jeremiah going to the Potter’s House was a way for God to convey God’s broken heart and frustration God felt toward the creatures of God’s own creation who would not respond to the shaping hand of God. We talk about being out of the will of God in terms of lying to cover tracks, fudging on taxes, or cheating on a spouse. Those are actions that place us outside the will of God. Essentially they are symptoms of our failing to pay attention to the ways God is shaping our life. The easiest way to be in the will of God so to reflect the character of God into the world is to cooperate with the shaping hand of God in your life. You will have to worry a lot less about drinking, smoking, and chewing, and going with the girls who do. Jeremiahs trip to the Potter’s House says God doesn’t a take hands off approach after creating. God is always shaping and remolding, even after we resisted God’s intentions for our lives. God does not discard us like a useless lump of clay because of our reluctance to respond. God salvages us by reshaping us until we are ready to cooperate again. God is a potter; wedging our selfish will and loosening our knots of pride so we can partner again with heaven’s desire for our hearts. Sometimes that work is easy on us, because we are cooperating with God. Sometimes it is painful, because God needs to apply pressure to reshape us. God natural laws in creation are the primary tools for shaping work. Thus, most people don’t even recognize God’s shaping hand. God fixed the laws of nature, designed molecular structure, ordered DNA sequencing and set relational boundaries. So, when we carelessly test Mother Nature, stress of our bodies with needless agents, ignore inward warning systems, and break bonds of trust we will experience repercussions, which are not mere coincidences; they are the potter ways of wedging the clay. My mother would say; “This hurts me more than it hurts you.” I thought, “Yeah, right.” Now, I know it’s true. No healthy parent gets their kicks in shaping their child by discipline. We would rather hug you than punish. Fortunately, we now know a whole range of disciplines between doing nothing and coming down hard. God also is able to employ many ways to shape us into the person that reflects the character of God. We hold the key to how God shapes our work; God responds to us. The closest I’ve come to a Potters House was in an amusement park. My only potter experience is pressing Silly Putty on the Sunday cartoons to get a print of Charlie Brown. I speak with little knowledge about pottery ware. I saw some made by broken pottery. 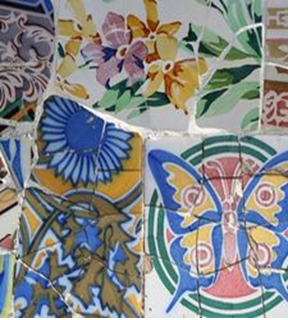 I know they call these mosaics, but this recycled pottery reminded me of our great hope. (LOOP) God’s hands are always at work shaping or reshaping you, despite your outward and obvious flaws known by others or your inward and private struggles known only by you. A genuine broken spirit and a humble heart is the perfect receptacle for God’s amazing grace. A life touched and healed by the shaping hand of God is ready for service in God’s kingdom. God generously is working to reshape you into beautiful and useful vessels God intended when you were fashioned in your mother’s womb. Pay attention these shaping ways so your work in God’s kingdom may more clearly reflect Christ’s kingdom here on earth and in heaven.